When attending the Cat on a Hot Tin Roof photocall in November 2012, Scarlett also had her portraits shot. These were relased this week. I added them to the gallery. Scarlett is on the cover of the Spanish (?) Italian (Thanks Mariana for correcting!) January 16th issue of F Magazine. I added the cover and scans. I was able to add the complete the Elle UK February 2013 album in the gallery. I added the magazine scans today. You can check them out by following the links below. With every new cover, comes a photoshoot. I added the first 2 pics of the shoot Scarlett did for Elle, shot by Rankin. Ever since her breakthrough performance in Sophia Coppola’s Lost In Translation, Scarlett Johansson has become known for exuding old school glamour on the red carpet. So it came as no surprise to see the petite actress play one of the most legendary icy blondes to ever work with Alfred Hitchcock in a film biopic of his life. Ahead of the movie’s release, Scarlett showed just why she was selected for the role of Janet Leigh in a series of smouldering photos captured by acclaimed photographer Rankin. As the February 2013 cover star of UK Elle magazine, the 28-year old’s retro curves were given a modern makeover using a fresh colour palette of next season’s designer offerings. Posted on December 28, 2012 December 28, 2012 Written by RopeComments Off on ELLE UK’s February cover star is Scarlett Johansson! ELLE UK’s February cover star is Scarlett Johansson! We’re starting 2013 off right with a superstar on our cover: Scarlett Johansson. The BAFTA Award-winning actress graces the February 2013 cover in a white dress by Victoria Beckham, along with white leather peep-toe booties by Manolo Blahnik for Beckham. Rankin also photographed the Avengers star in new-season designs from Jonathan Saunders, Tom Ford and Burberry Prorsum. In the accompanying interview, Johansson talks about her bombshell status, marriage and her perfect New York night. Read the rest when the issue hits newsstands on Wednesday 2 January. 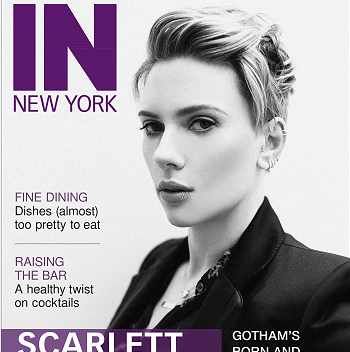 Scarlett is the covergirl of the January issue of the Russian Esquire magazine. I added the cover and a few scans to the gallery. Enjoy! Posted on December 18, 2012 Written by Aniek1 Comment on New layout at Scarlett Fan! New layout at Scarlett Fan! You probably noticed it already! Scarlett Fan.com has a brand new layout by Ina – Blake Lively Central! She did an awesome job creating a layout even better than the ones we had before. I hope you like it just as much as I do! Also: check out scans of Scarlett on the cover of the German “Woman” magazine. Photos of Scarlett at the Press Conference for Hitchcock (November 17th, the Parker Meridien Hotel, New York) have been added to our gallery. As always, enjoy them! Scarlett was photographed yesterday arriving to Letterman studios to tape her interview. It will be aired tonight, so stay tuned! Posted on November 21, 2012 November 21, 2012 Written by Rope1 Comment on ‘Hitchcock’ Ladies in New York! ‘Hitchcock’ Ladies in New York! Scarlett, along her Hitchcock feminine co-stars Helen Mirren, Jessica Biel and Toni Colette, hit the red carpet on Sunday night for the premiere of the movie! Our girl chose a Rodarte floral dress and Gucci Shoes, and she opted for a natural make-up look, but adding some colour to her lips! She looked fantastic! What do you think? Scarlett Johansson was scared to death when she shot the infamous shower scene from Psycho for her new film Hitchcock, because of co-star Anthony Hopkins. Scarlett, who plays actress Janet Leigh in the film, says that she didn’t mind stripping down and getting all wet to film the iconic scene — but she did have trouble getting Hopkins’ portrayal of cannibalistic Silence Of The Lambs serial killer Hannibal Lecter out of her head — something that actually helped her nail the scene. “Hmm, how did I prepare? Well, I just prepared myself to get very, very wet,” she tells V Magazine. “We only had the luxury to shoot the scene for a day, and everybody was feeling very nervous because it involved water and nobody wants the actor to get wet. They were concerned with modesty and all these things — but I don’t care about any of that stuff and Janet Leigh never did either.